We can start by saying that DHS’ acting Secretary Elaine Duke could probably have chosen her words better in a statement on Thursday. Compared to how bad it could be, that may be true. But it would surely ring hollow in the ears of people with no shelter scrabbling for food and water on an island where all electrical power has been lost, and most home structures have been devastated. There was probably a better way to say this. Rosselló and San Juan Mayor Carmen Yulín Cruz have been largely complimentary about the disaster response so far. After Ms. Duke’s comments on Thursday, however, Yulín Cruz burst out with an angry denunciation, duly transcribed at Politico. “Well, maybe from where she’s standing, it’s a good-news story. When you’re drinking from a creek, it’s not a good-news story. When you don’t have food for a baby, it’s not a good-news story,” Cruz told CNN’s “New Day,” referring to the plight of Puerto Ricans, many of whom have received little or no aid thus far. “When you have to pull people down from their buildings — I’m sorry, but that really upsets me and frustrates me. You know, I would ask her to come down here and visit the towns, and then make a statement like that, which frankly, it is an irresponsible statement. The mayor’s frustration is understandable, although she too could probably have chosen her words better. For one thing, it’s premature to talk in recriminatory terms about people dying, when we simply don’t know yet how many people may have died in addition to the 16 whose deaths were accounted for immediately after the hurricane swept through. But we could let all that pass. We could, that is, if the media weren’t dedicated to making it look – falsely – as if the Trump administration is whiffing on its response to the devastation of Puerto Rico. 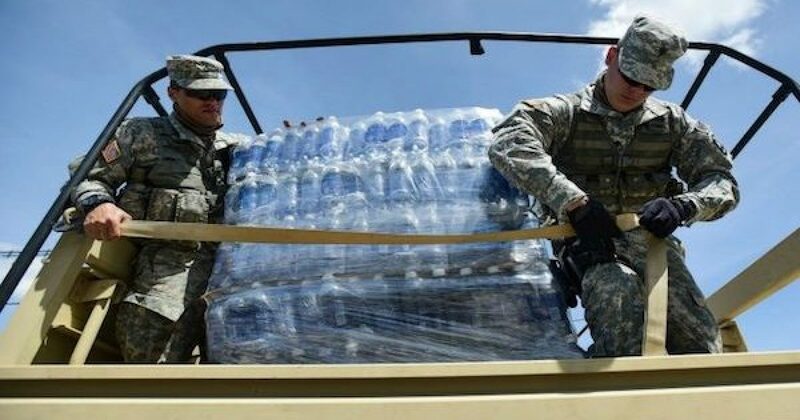 Yet the military, which has been stationed offshore for response since before Maria came through, has been providing aid 24/7 in the days since, is deploying thousands of troops with heavy equipment and supplies to Puerto Rico, and has more Navy and Coast Guard ships deployed off the island, and heading to it, then there are in the Persian Gulf and Mediterranean combined. The federal response across all agencies was reported by DHS over a week ago, with most of the items on the list accomplished by now, including the launch of the all-important restoration of power to the island. As Bloomberg’s reporting acknowledged (link in the last paragraph), the administration has not, in fact, botched its response in Puerto Rico. So it’s necessary to keep that in mind when assessing Trump’s undoubtedly combative reaction to the outburst from the San Juan mayor. It probably wasn’t necessary for Trump, either, to criticize the mayor’s leadership on a personal basis. But Trump isn’t just trying to shape perceptions of how he’s handling things. The third tweet makes clear that he’s doing the leader’s job of praising his people and keeping their spirits up – in spite of the media attacks on him. The media war to make Trump’s performance look bad ends up reflecting on the thousands of federal workers, military and civilian, who are already doing everything they can to bring Puerto Rico back and ease the suffering there. It doesn’t help Puerto Rico at all, and it’s a morale blow to the disaster-response workers, to have their performance so badly misrepresented. What, incidentally, did Trump mean in the first tweet, in which he said this? If you don’t care what he meant, I salute you – as long as you are equally dismissive of the media’s effort to smear the Trump administration’s response in Puerto Rico. The media are trying to sell a lie. 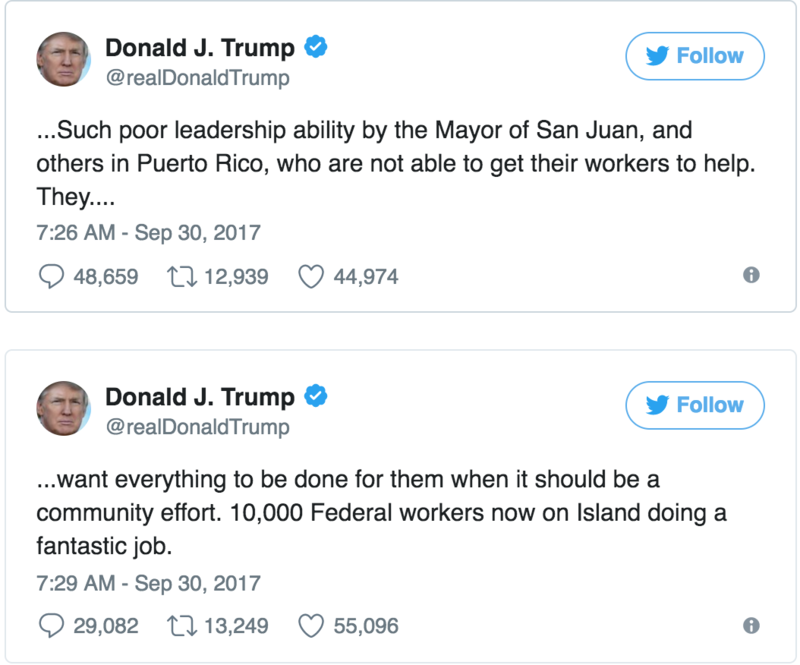 Trump is neither better nor worse in alluding gratuitously to the politics of Mayor Cruz, a far-left activist who lobbied intensively for the release of FALN terrorist and murderer Oscar Lopez-Rivera prior to Obama’s last-minute commutation of his sentence in January; who testified to the UN in 2016 that Puerto Rico is basically suffering as an occupied colony; and who endorsed Hillary Clinton in 2015, but then withdrew her endorsement because Clinton wasn’t far enough left in her policies. It is as unattractive as Trump’s own trenchant tweets, to be sanctimonious about how he “should” be communicating in the face of the relentless media assault on the truth about his presidency. There is no option for Trump of taking the high road and keeping the public conversation elevated. 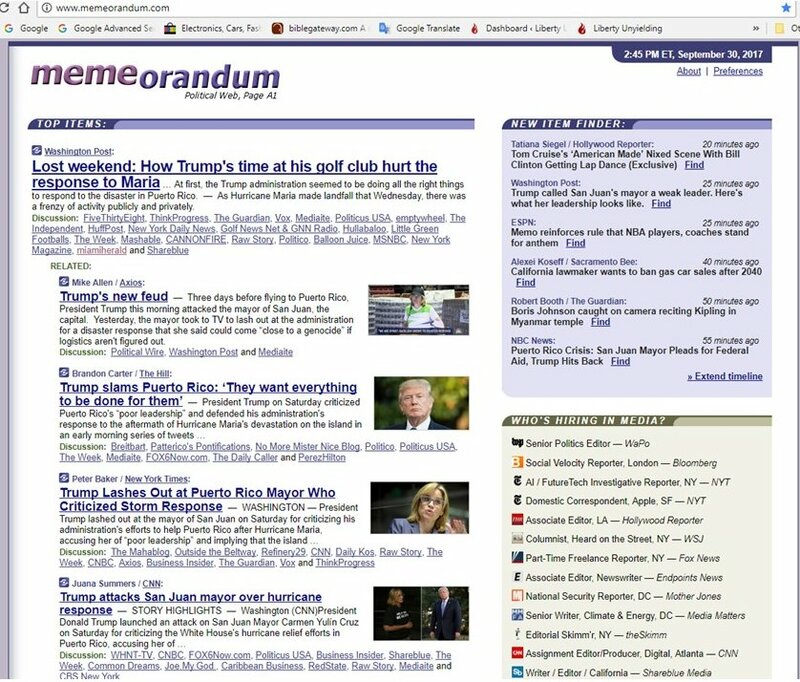 We know that from the long-running campaign to distort and defame George W. Bush’s response to Hurricane Katrina, about which many Americans still to this day believe decidedly un-elevated media falsehoods. By tweeting in his signature way, Trump draws fire to himself and reminds his audience of the tough job the federal response force is, in fact, doing in Puerto Rico. It’s a kind of combat tactic, rather than conventional political discourse – but America is in combat with the mainstream media, and has been for some time. The mainstream, anti-Trump media want to win a war against America and to deconstruct and denature the very essence of what America is. Everything they support and everything they hate — which is now what their reporting is mostly about; their agenda — make that clear. Meanwhile, the job in Puerto Rico is getting done, which is what matters right now. There is no doubt things that could be done better; there always are. But I wouldn’t trust the anti-Trump media reports seen in Memorandum to tell me what those things are.